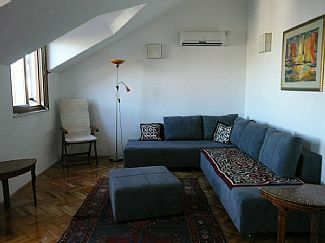 The apartment is located on the top floor offering a stunning view of the Adriatic sea and Solta & Brac Islands. It is a two-bedroom of 60 sq.m. It is tastefully and elegantly furnished to a very high standard featuring Italian furniture, Moroccan coffee tables, Caucasian rugs and modern art pictures. Eric and Joanna Tonon, married, one son. Outside: South facing large balcony, featuring sunshade, teak furniture and barbecue large garden. One parking lot. Cleaning / Towels / Linen / Maid service: Maid service available for cleaning and cooking. Cultural holiday (proximity with medieval towns of Trogir and Split. 4 pebble beaches within 5 minutes walking distance. Close to a village shopping center including one supermarket, a pharmacy, a post office, a bank with an ATM machine, a newspapers stand, two bakeries, one butcher, a travel agent, a tourist center, two cafes (one with internet) and one delicious restaurant there is also a fish market twice a week. 10 one day excursions available from local agent. Close to 4 national parks. Excellent local food and wine. Easy to get to: only 15 km from Split airport which offers regular and low-cost connections with the majority of big European cities. Close to 4 beaches within walking distance, the closest in less then 5 minutes. 8 minutes to the diving school. 4km away from the fabulous medieval city of Trogir inscribed on a World’s. Booking Notes: Please contact owner. Changeover Day: Saturday. Notes on prices: Depending on the season, average 600 euro per week.